I like change. I like the excitement and energy of something new. I like the experience of interactions with new people, places, and things. I'm invigorated by change and actively seek opportunities for change in my daily life. I live my life in search of opportunities for change. Yes, you could say I love change. Except when it's forced upon me. I was forced to make a major change several years ago, and my experiences gave me a few new insights on how to manage change. I have a hereditary hearing loss that has caused me to loose the frequencies that make up the normal speaking range for most people. At first, it wasn't much of a problem at home except when watching TV--I could hear the music find (higher frequencies) but had a hard time with the dialog (lower frequencies). It was hell in a business environment, especially in a large room where the voices got lost to the room. One-on-one could do well, but being in larger groups made my life difficult. With strong encouragement and support from my dad, who also has this hearing loss, I got a pair of 4-channel digital hearing aids. Digital hearing aids primarily amplify only the frequencies for which the wearer has difficulty. The analog hearing aid amplifies all of the sound, not just the frequencies the wearer has trouble hearing. I tried these, then state-of-the-art hearing aids, for about 30 days and I was greatly disappointed. Yes, I could hear things that I couldn't hear before. Unfortunately, the new sounds extended beyond the dialog I had been missing. I could hear everything more clearly, including conversations across the room that made me feel like I was eavesdropping. I was suddenly overwhelmed with sounds, most of which I classified as "noise" and I had a hard time distinguishing between what I needed to hear and what I was hearing. I hated it. At the end of 30-days, I was ready to give it up. I talked with my doctor, who told me that Siemens had just released a new, 16-channel, digital hearing aid that would allow for finite programming of the hearing aid across the channels to better fit my loss. He also told me (again, actually for about the 4th time), that hearing aids won't replace my natural hearing and that I would have to learn to "hear" all over again (i.e., learn what to tune out). It occurred to me at that point that I wasn't fighting hearing aids, I was fighting change. Due to circumstances beyond my control, I was being forced to change and adapt to a new situation. I laughed at the irony. Here I am, a guy who thrives on change and helping others improve business models and processes, a guy who understands that 95% of change is about people and I'm fighting change. 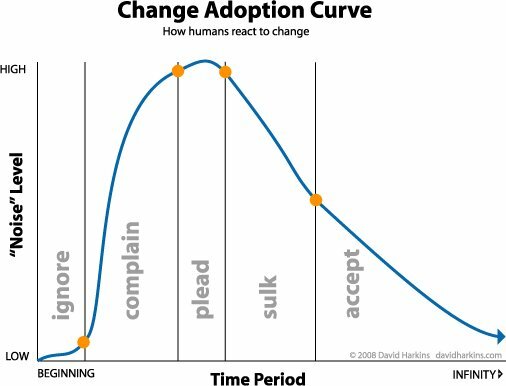 I was solidly rooted in the "Change Adoption Curve." It took me months to work through the first four stages and several years to finally accept the change. It's been about five years since I started wearing hearing aids. The change has been overwhelmingly positive for me. Part of the success was likely increasing the number of programmable channels, although I suspect the biggest reason for my adoption was retraining my ears to listen. Perhaps most important to me in this experience was learning, first-hand, that people must want to change and buy-in to the benefits the change will bring. Change can't be forced upon them. Human beings like to have some sense of control and often change processes, in business particularly, are about mandating change. Forced change almost never works and now thanks to a little problem with my hearing, I understand why. Previous PostAre you making promises you can’t keep? Next PostIf innovation is a good idea, it’s worth doing poorly. Branding	Are you making promises you can’t keep?